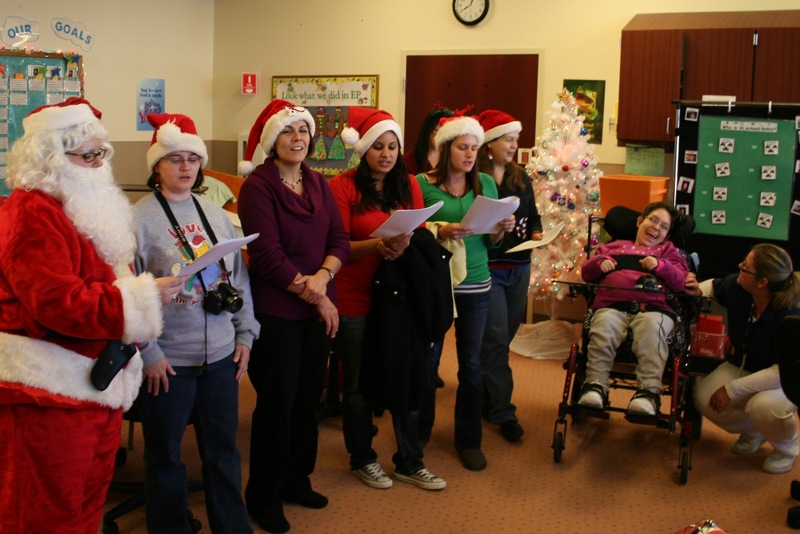 Ashley smiles as nursing students from Thomas Nelson Community College sing “Rudolph the Rednosed Reindeer and other classic holiday songs in her classroom at St. Mary’s Home. First, they took their finals. 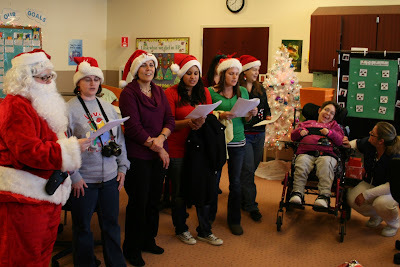 Then, they came to St. Mary’s Home to spread some holiday cheer. And of course, they brought Santa with them. A group of nursing students from Thomas Nelson Community College finished their final exams this morning, then dropped by the Home to bring presents for the children — and candy canes and chocolates for the nursing staff. 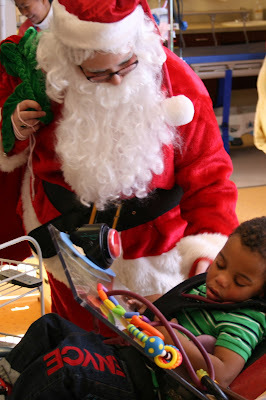 They also visited with children in the classrooms and sang Christmas songs. 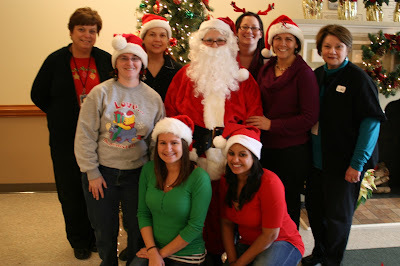 The nursing students (including Santa) were already familiar with St. Mary’s, having done clinical rotations at the Home. Their holiday visit continues an annual tradition started by Thomas Nelson nursing students in the late 1990s. “This is something very, very generous for the students to do,” said Susan Kok, St. Mary’s director of staff development, who welcomed the group back to the Home today. The Thomas Nelson nursing students with Marilou Wilder, far left, and Susan Kok, far right, from St. Mary’s staff. Many generous people across the nation have donated money to help Haiti recover from the earthquake in January. At St. Mary’s Home for Disabled Children in Norfolk, employees recently took up a collection and raised $1,705 to send to the Daughters of Wisdom to use for their Haiti relief efforts. St. Mary’s Home has had a special connection to the religious order for most of its 65-year-history. Nuns from the Daughters of Wisdom arrived at the Home in 1946 to take charge. Today, the sole nun still on the staff, Sister Mary June Morin, is starting her 51st year of working at St. Mary’s. So, when news came that six Daughters had been killed in the earthquake, St. Mary’s staff was especially moved to help. The money raised by employees includes $450 from a Valentine’s goodie sale/baked goods raffle organized by the Nurses Environmental Committee, which focuses on building camaraderie among the staff. 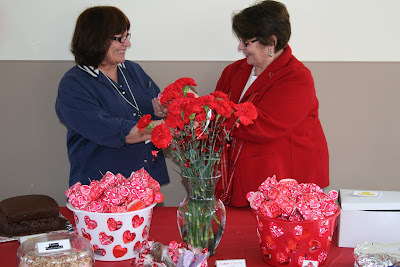 The photo shows committee members Janie Mines, left, and Susan Kok, right, among the carnations and boxes full of Hershey’s Kisses that were for sale. The committee also raffled off (mostly) homemade baked goods. Be a Part of the Good Life!